Game designers are people, too. 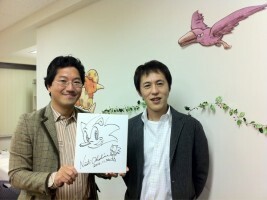 Some, like Yuji Naka and Naoto Ohshima, will forever be related however, arteries to the heart of Sonic the Hedgehog. This week, the two reunited, according to Mr. Naka’s Twitter. Ohshima, Sonic character designer, worked up some of his artistic magic at what appears to be the PROPE studio, as demonstrated by the above photo. When the two were done, they met up with current Sonic Team head Takashi Iizuka, and the three had some drinks and memories together. Oh, to be a fly on the wall in that room.